Lot Detail - The Chaplain of The "Bloody 8th" Virginia Declares: "Secession Has…Has Shaken Her Wall From Pillar To Ceiling." The Chaplain of The "Bloody 8th" Virginia Declares: "Secession Has…Has Shaken Her Wall From Pillar To Ceiling." Charles F. Linthicum (1838-1864) born in Maryland, was a man of divinity, known as the Confederacy's "Fighting Chaplain" who as a member of the 8th Virginia Infantry followed his men into the field. He writes here, just days after South Carolina seceded, his fears that the nation will be torn apart by civil war. His fears proved true and he entered the war as a chaplain, cheerfully joining his men in combat with a musket. His actions during the war was held in high regard by the generals who met him and he soon was promoted to captain and held many staff positions. At Gettysburg he was the only member of Richard Garnett's staff to survive Pickett's Charge, but not after having two horses shot out from under him. In 1864, though, at Cold Harbor his luck ran out and he was was killed during while carrying dispatches for General Eppa Hunton. Within months of being ordained minister in late 1860, Lithicum was assigned to divine duties in Loudoun County, Virginia and from there at Bristoe Station, on January 7, 1861, he writes a, 4pp. 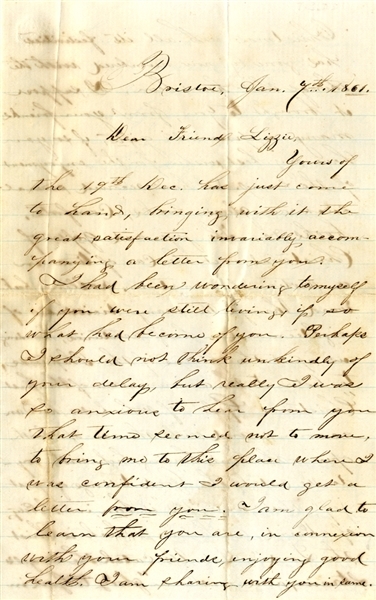 8vo., letter to his "dear friend Lizzie", that reads, in small part: "…let us catch the angel's strain and exclaim "glory to God and exclaim…peace, good will toward men"…but Lizzie, doesn't seem that instead of going "glory to God" that our people especially have turned the glory of God into shame and turned to their own evil ways-yielding…to the loosing of God's spirit to the corrupt inclinations of a corrupt and carnal mind? It has always seemed to me that America was but a second Canaan and the America people God's chosen. But now, I…hear him say "I will give them up to their own heart's lusts. "…the blow of secession has removed one stone already, which has shaken her wall from pillar to ceiling. I fear that the binding stone is gone and the cement of the brotherhood is no more…our "glorious Union must crumble into stone. God grant that she may silently crumble and not explode by Civil War. But the people here except nothing else. Secessionists are very common in Prince William [County, Va.]…a warm time is looked for. I hope grace may temper and govern her members…C. F. Linthicum. Also included is a copy of Lithicum's biographical sketch from the Confederate Veteran magazine. Near fine.